The truth is, it really doesn’t matter! What’s important is who is responsible for making things better and the answer to that is always the same. I am. 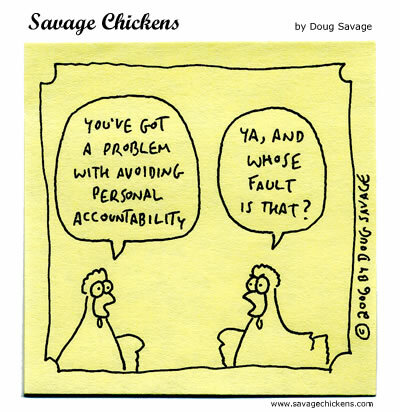 We spend far too much time appointing blame when things don’t turn out the way we want them to. There is a school of thought that absolutely everything that ever happens to you is your fault, that you somehow asked for things to happen to you. Personally I think that’s a bit harsh and honestly not at all helpful. Even if, on a metaphysical level, we do create our universe, assigning ourselves blame and guilt is not going to put us in a state of mind conducive to moving forward. The answer to the question “Who’s fault?” lies in the past and there is nothing we can do to change the past. So even if we can arrive at a meaningful answer there’s not much useful we can do with it. But it is always our responsibility to learn. If we take a difficult situation and choose to assign blame we will always be stuck in the past, wishing we can change it, which we can’t. If we choose instead to take the lessons and try to put them into action we can come out of any situation better, wiser and stronger that we started. I think we all do. Its a great delaying tactic! As long as we are busy assigning blame we don’t have the time or the energy to actually fix the problem! Dream Believe Inspire Institute - Home of the Enlightened Youth With Minds of Steel & Hearts of Gold! Cars, supercars, travel, racing, food and Dubai. It's a tough job, so I'm glad I get to do it!